Ferritic oxide dispersion-strengthened (ODS) steels containing Fe–17Cr–0.89Mn–0.89Si–0.25Y2O3–1.5ZrO2–3Al (wt%) was prepared through mechanical alloying, and X-ray diffractogram was used to analyze crystallite size for different time intervals during milling. Milled powders were consolidated at three different temperatures 1050 °C, 1100 °C and 1170 °C at three different pressure levels of 30, 40 and 60 MPa at different cooling rates 5 °C/min, 25 °C/min, 50 °C/min. Optimization of three parameters, namely sintering pressure, sintering temperature and rate of cooling, was done in this current study through design of experiments. Analysis of variance technique inclusive of signal-to-noise ratio was employed to optimize the processing parameters through L9 orthogonal array which predicts the response variable like density, tensile strength and hardness in the present study. Density and mechanical properties of powder metallurgy component are governed by sintering parameters. From the results, it is observed that in sintering pressure increases the mechanical properties and density. Samples sintered at 1170 °C with the pressure level of 60 MPa and rate of cooling 50 °C/min exhibit higher sintered density, hardness and tensile strength than the other sintered conditions. Sintering pressure is the most prevailing factor followed by the vacuum hot pressing inducing density and mechanical properties. Analysis of variance and Taguchi method were used to find the optimum parameters for attaining the superior mechanical properties of the 17Cr ferritic ODS steel. 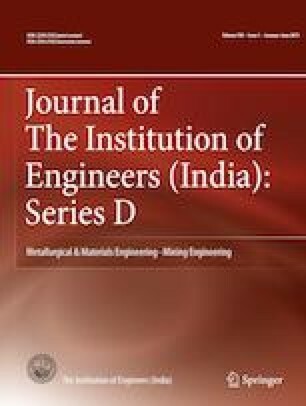 The authors would like to thank Vel Tech Rangarajan Dr Sagunthala R and D Institute of Science and Technology, Chennai, India for providing the research facilities. The Authors also would like to express sincere thanks to Department of Science and Technology (No. 457 DST/TSG/NTS/2013/03-G) for providing the funding for the project under the scheme of Technology System Development. The authors also acknowledges M/s SANDVIK for supplying 430 L ferritic stainless steel powder.